In 2012 the rules changed. Organizations that implement a strategic content management initiative are the ones who see digital revenue exceed print. By now publishers understand that managing content in one central location is the starting point to do all sorts of interesting things---automated delivery to third-party aggregators, ebook distribution channels, unbundling of journal articles. You can’t get to the wonderful world of apps or a single-source workflow without a CMS infrastructure in place. In this panel discussion, led by John Prabhu from SPi Global, CIOs from two organizations will detail how a strategic CMS has led them to discover, produce, and market new products that increase their bottom line. Throughout the day at the 2012 RSuite User Conference our engineers will be available to you. We'll have a dedicated room where your technical staff can dive deep with RSuite's technical staff to understand the code behind the CMS. How does the latest version change the data storage model? What search improvements are available? What are best practices regarding custom UIs? What are the appropriate patterns for URL resolution for assets stored in plugins and elsewhere? We'll have these answers and more! Come, ask an engineer. While using internal resources to develop a homegrown content management tool or convert your backlist to XML sounds like a cost-effective approach, the reality is that most IT projects fail. Focussing internal IT resources on experimenting with new technologies and applications (R&D), vendor selection, and vendor management is the trend most publishers are following. Capitalizing on external resources can increase time to market, offer scalability and expertise, provide consistency and quality, and ultimately improve your ROI. She'll provide concrete examples from STM and educational publishers that detail how content management and XML are the building blocks for the next generation of content and how vendor selection and alignment is a good use of corporate IT resources vs DIY when it comes to content conversion and content management. RSI Content Solutions, a leading content management system software provider, announced the addition of David Saracco as vice president, business development to expand the RSuite CMS sales team and help further develop key publishing markets. He brings more than 20 years’ experience having worked at global publishing companies as well as publishing service and technology companies. David will be based at the RSI Content Solutions headquarters in Audubon, Pennsylvania. 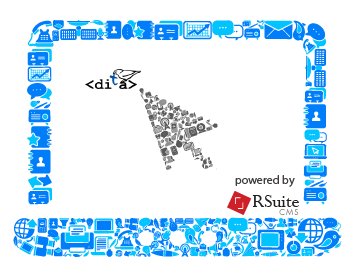 At the 2012 RSuite User Conference on September 20th, attendees will hear how the following people are using the powerful combination of RSuite CMS and DITA. Publishing standards are intended to streamline data interchange and make the lives of publishers easier. But there are so many standards (and standards for standards) that it’s hard to keep track of what’s important, which standards are emerging, and the usefulness to an organization. Chet Ensign, director of standards at OASIS will speak to the array of publishing standards in use today and zero in on one standard that is helping publishers transform structured content to designed content. RSuite CMS and the open source DITA for Publishers project (based on the DITA standard) streamlines the creation and production of content to multi-channel publishing formats, including InDesign, variable XHTML, PDF, EPUB, and MOBI. Hear how Human Kinetics Publishers and Macmillan Higher Education are using this powerful combination: RSuite CMS and DITA. According to a Pew Internet and American Life study, the number of adults who own tablets nearly doubled between mid-December 2011 and early January 2012, jumping from 10% to 19%. Coincidentally, according to the same study, the number of adults owning e-book readers also doubled from 10% to 19% in the same period, and the number of adults owning at least one of those devices leapt from 18% to 29%. There is simply no denying it—we find ourselves in the midst of a fundamental change in the way information is presented and consumed across all sectors of publishing. From trade to children’s books, from STM to legal, from education to association publishing, the very rules of how we do what we do are being rewritten (and likely being read on a PDF or EPUB). And the rewriting of these rules is happening so quickly—to an industry that’s done things more or less the same way for centuries—that lots of publishers are struggling as their print revenues shrink faster than they can grow digital revenue. In this free white paper you'll learn how to manage and refine your content—then, sell it quickly, efficiently, and in more forms than you ever imagined possible. SAGE Open is a new open access publication from SAGE Publications. It publishes peer-reviewed, original research and review articles in an interactive, open access format. Articles may span the full spectrum of the social and behavioral sciences and the humanities. SAGE recently won its first award, the 2012 APEX Award for Publishing Excellence. SAGE Open recently published its 100th journal article after winning the prestigious APEX Award. The success of this journal has lead to the recent announcement of three new open access journals for SAGE: SAGE Open Engineering, SAGE Open Medical Case Reports, and SAGE Open Medicine. 5years ago, SAGE had fewer than 100 digital assets online. By the end of 2012, SAGE is expecting to have more than 5,000 online digital assets. with the improved searchability and metatagging provided by RSuite CMS, SAGE is now able to provide its clients with precise figures regarding the number of articles in their archive related to specific topics, along with the ability to provide controlled access to its library of content. Want to learn how RSuite CMS can help your publishing organization? At the 2012 RSuite User Conference on September 20th, Christopher Hill, VP of product management at RSI Content Solutions, will present the RSuite product road map. The award-winning RSuite CMS has been the choice of scholarly publishers, global information, and media companies to create, transform, and deliver a digital future. At the 6th annual RSuite User Conference, Christopher Hill, vice president of product management at RSI Content Solutions, will detail what’s in store for upcoming releases. He'll also illustrate how RSuite CMS is used at various organizations. While some publishers focus RSuite’s strengths during content creation, others use RSuite solely for distribution to licensing channels. Content creation, editorial, production, distribution---RSuite CMS manages content through the entire life cycle.